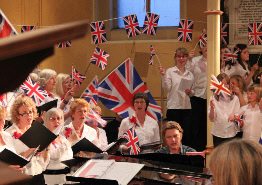 The ‘Best of British’ concert at St. John’s Church was part of the Ashbourne Festival 2012. By 7.15pm St. John’s was full and absolutely buzzing with expectation. The church was bedecked with flags and bunting, topped by a lovely red, white and blue flower display and there was a great ‘concert’ atmosphere on this rare sunny June evening. It was very encouraging to see so many supporters of the choir which has worked so hard to achieve such a high standard. From the excellent opening chorus of ‘I Was Glad’, right through to the ‘Beatles Medley’, the quality of the singing and choral harmony sustained a standard which brought an enthusiastic applause from the appreciative audience. There were a number of highlights which have to be mentioned. ‘Zadok the Priest’ by Handel was the first music ever played on Classic FM when it burst onto the scene 20 years ago. It was stunning then and was so again on this occasion. The choir, singing this great piece, were at their best and accompanied by Michael Halls on the church organ. After this the audience had their chance and responded with great enthusiasm, singing ‘Guide Me, O Thou Great Redeemer’. Now was the opportunity for the young singers to perform, singing ‘The Mallow Fling’. They sang with great confidence and improved with every performance underlined by the marvellous reception and applause they received. Ashbourne’s own ‘16’ emerged from the choir and sang two numbers. This was followed by the Young Ashbourne Singers, joined by the full choir and brought the first half to a close with ‘Any Dream will Do’ by Andrew Lloyd Webber. The blend of the full choir and the youngsters was delightful. Teddy Bears’ Picnic’ was sung a capella, then Stephen Duckworth accompanied by the youngsters in the chorus performed Elton John’s ‘Your Song’. It was brilliantly sung throughout and brought ringing applause from the audience. Donning old fashioned caps, the youngsters sang ‘A London Medley’ with enthusiasm. There are some fine singers in this young choir and it is sure to grow in stature. The audience responded with a great cheer. Now was the time for Linda Perry Smith to sing a solo in the arrangement of ‘Amazing Grace’ by Stephen Duckworth. This she did with crystal clarity and was joined with a sympathetic and balanced support from the choir. It was a performance of the highest quality. ‘Wherever You Are’ was sung beautifully by the ladies and they were followed by the gentlemen singing a confident ‘Those Magnificent Men in their Flying Machines’, after which the whole choir sang a well composed ‘Beatles Medley’. However, all was not done yet and the audience, pleased to join in, sang two verses of ‘God Save the Queen’ and of course, ‘Land of Hope and Glory’. A great way to end a memorable evening of tremendous live entertainment.